Over recent months we have been drawing the attention of banks known to finance Indonesian paper company, APRIL, to the company’s dire record of deforestation and social conflicts in Sumatra, and its failure to restrain its activity to conform even with its own weak policy. Some European banks have listened, and have committed to avoid future loans, unless APRIL makes dramatic improvements to its fibre sourcing policy and implements it properly. We have been particularly encouraged by Santander and ABN AMRO, who have made such commitments. 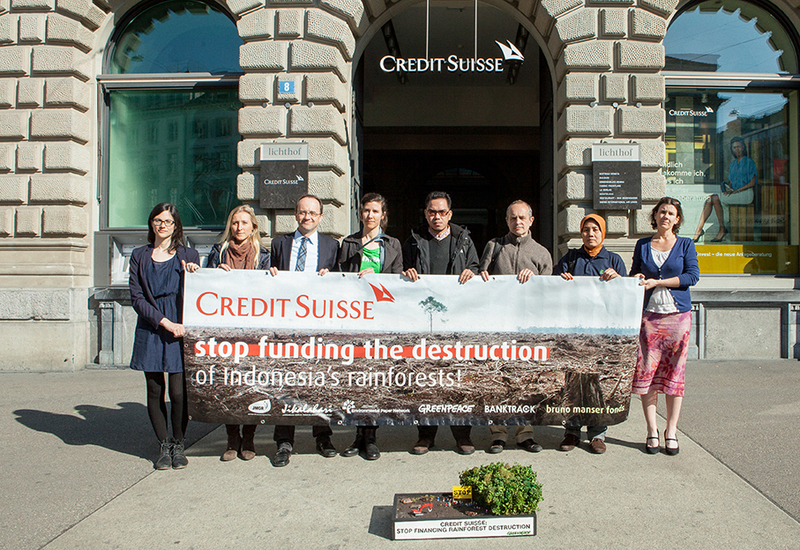 Last week we helped to organise a joint action around the Credit Suisse Annual General Meeting (AGM), with the Bruno Manser Fund, Greenpeace, Banktrack, and two Indonesian NGOs, Jikalahari and JMGR. We wrote to tennis star and Credit Suisse ‘brand ambassador’ Roger Federer urging him to help stop Credit Suisse from funding deforestation in Indonesia. One day before the AGM we handed over the more than 24,000 signatures collected by the Greenpeace petition regarding CS’s involvement with APRIL. We also held a small banner protest outside the bank, followed by a meeting inside. We had a prominent banner outside the AGM and were able to ask questions at the shareholders’ meeting. After asking questions, our Indonesian colleagues gave the bankers a present: a bit of Indonesian peat. Although the bank has made no public statement we feel reassured that those responsible for the risks of the bank’s investments now understand clearly how much is at stake if they continue to finance deforestation in Sumatra. See here, here, here and here for coverage.